A few days ago, on Meta.StackOverflow, a product manager asked for feedback on how they could make first contact between employers and potential employees more valuable to the potential employee. I provided my feedback. I've reposted it below, with some minor changes to further explain my ideals. The summary of this entire post is: If I have to spend time to make my resume jump out and catch your attention, I expect you to spend just a little bit of time telling me about your company and the position you are recruiting for. I don't think a few sentences with these details is that much ask. I want to know what the company does and I want to know who you are. I also want to know what positions you are looking to fill and a few details about the position are also important. What the company does (other than "build great software"). Explanation which of my skills or experiences they are interested in. Are you interested in my Python answers on Stack Overflow? My projects on Github? My PHP experience from years ago? This is important to know. If the company is looking to recruit me for knowledge I shared years ago (ie. PHP in my case), I'd probably be less useful right now because I haven't used PHP in years. I have not kept up with recent changes to the language or various frameworks. Explanation of what the position will do, projects I'll be involved in, or challenges they are facing now that I'll help solve. I did not respond to this position. I know your name, position and company. Due to who the company was in this particular message, I am even vaguely aware of what the company does. Name recognition helps, but is not very high on my list of "important things"
A description of the position. "Looking for top talent...to make a significant impact on our systems". Ok. How? What will I be doing? Lack of any details at all and use of buzzwords ("top technical talent", "fast paced", "start-up like", "eCommerce industry"). Discussion about personal career goals and technical background. Some of my back ground should be obvious from my Careers profile, SO profile and links on both. More importantly, I missed the "personal career goals" flag. The details they wanted were to see if my goals aligned with any open positions they had at the time. 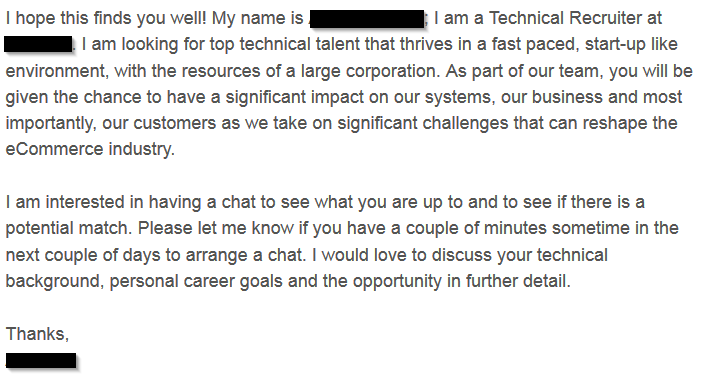 When the discussion took place, the recruiter knew little more than my name. There were no questions about my careers profile (at the very least) or other projects I mentioned on my profile. This message isn't useful to me at all. Who is this company and what do they do? I have no experience in mobile apps. How did they find me? What is Chad's relationship to the company? I suspect this message showed up because I work for one of their largest clients, live 10 miles from their office and work, literally, right across the street from them. I didn't know that at the time though. I had to ask a co-worker if they'd ever heard of the company. They pointed out their office at lunch. I did not respond this this message. You are seeking employees who are willing to relocate. Great. Good for you. Are you interested in my skills or just a warm body to keep your chairs warm? No name at all. Who am I talking to? No details about the job. I hope they found someone to hold their seats to the floor 8 hours a day. If not, I recommend large rocks. I need details and I need details more than what the salary is going to be. Obviously, I need to do some research about your company, if I've never heard of you. But, throw me a bone. Tell me a bit about your self. I had to make a fancy resume to get you to reach out to me. I did something that caught your eye. Now, do something that will catch mine. "Here at COMPANY NAME, we are looking for a POSITION with skills in LANGUAGE or experience in INDUSTRY. I see you have both and think you'd be able to help TEAM NAME with their on going project of MAKING THE WORLD BETTER. Your PROJECT ON GITHUB looks like you've dealt with aspects of this problem before. We've gotten some press recently about our innovations in this area (check them out HERE)." Indicate they've at least looked at my resume by commenting on some aspect of it. I've had recruiters mention projects I've done, jobs I've held, or individual bullet points that caught their attention. This is great. It means you aren't reaching out to me because I happened to hit all of your keywords when the resume passed through your Human Resources department. Provide a short description of the job they want to fill. I don't need a full job posting. A link to such a posting is sufficient. However, if you could summarize it in a sentence or two, that'd make both of our lives easier. Reading full job descriptions isn't the most fun thing in the world and often have industry (or even company) specific acronyms. That isn't helpful to either of us, because I may not know them. Just tell me what your team does within the company. That's good enough to get my attention. Talk to me like a person, not some number that a database search returned. As a hint, if you can figure out that I like to go by "Andy", instead of "Andrew", you've already done a far better job than most recruiters I've spoken with.